The award-winning author of You Bring the Distant Near explores identity, homecoming, and the legacy of assault in this personal and ambitious new novel. Katina King is the reigning teen jujitsu champion of Northern California, but she’s having trouble fighting off the secrets in her past. Robin Thornton was adopted from an orphanage in India and is reluctant to take on his future. If he can’t find his roots, how can he possibly plan ahead? Robin and Kat meet in the most unlikely of places—a summer service trip to Kolkata to work with survivors of human trafficking. As bonds build between the travelmates, Robin and Kat discover that justice and healing are tangled, like the pain of their pasts and the hope for their futures. You can’t rewind life; sometimes you just have to push play. 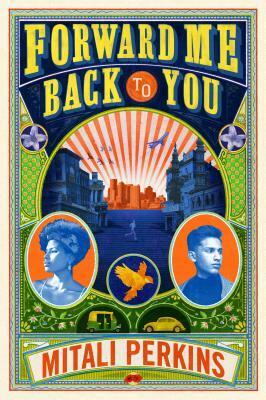 In turns heart wrenching, beautiful, and buoyant, Mitali Perkins's Forward Me Back to You focuses its lens on the ripple effects of violence—across borders and generations—and how small acts of heroism can break the cycle. Mitali Perkins has written many award-winning books for young readers. Her novel, You Bring the Distant Near, was a Walter Honor Book and a National Book Award Nominee, won the South Asia Book Award, and received six starred reviews, in addition to other accolades. Mitali was born in Kolkata, India, and has lived in Bangladesh, England, Thailand, Mexico, Cameroon, and Ghana. She currently resides in Northern California. "A budding romance, a richly evoked setting, and beautiful intergenerational relationships pepper this story . . . a surprisingly sweet and delicately plotted novel . . . Perkins' present-tense prose and the use of stage direction–like notations about scene locations work to give the book an ethereal tone, a dreamy contrast to the grit and sadness that the characters endure, and more reflective of the overall message of hope, connectedness, and love."